Pachmarhi, Madhya Pradesh's only hill station, is nestled on a plateau in the splendorous Satpuda Range in Central India, and hosts an impressive variety of wildlife. Dotted with several scenic waterfalls, caves and forest patches, Pachmarhi deservedly earns the title 'Queen of the Satpudas'. 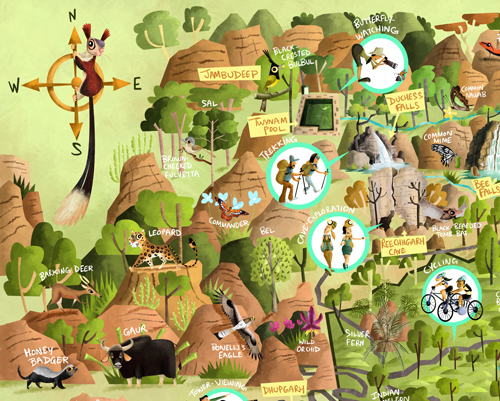 An Indian Giant Squirrel graces the map's compass. Satpuda Tiger Reserve also has this species as its official mascot! 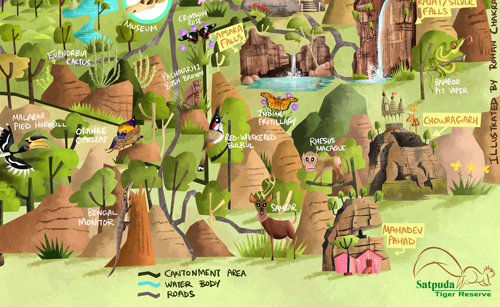 Captain James Forsyth, a British officer and avid explorer, spotted Pachmarhi Plateau in 1857 alongwith Maj. Nathuramji Powar, and set up one of India's first forest lodges here (The Bison Lodge, illustrated in the map) and named many of its destinations. 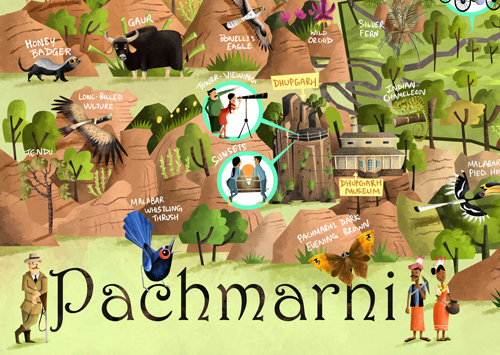 Forsyth is seen here alongside the title, with a Malabar Whistling Thrush, the Pachmarhi Dark Evening Brown butterfly, and a Gond couple. Gonds are the main tribe dwelling in the region. The bird life of Pachmarhi which is unique in having species both from the Himalayas (such as the Black-crested Bulbul) as well as the Western Ghats (such as the Malabar Pied Hornbill and the Malabar Whistling Thrush), goes on to assert the Satpuda Hypothesis, that suggests that the range is a biogeographical link between the Himalayas and the Ghats. 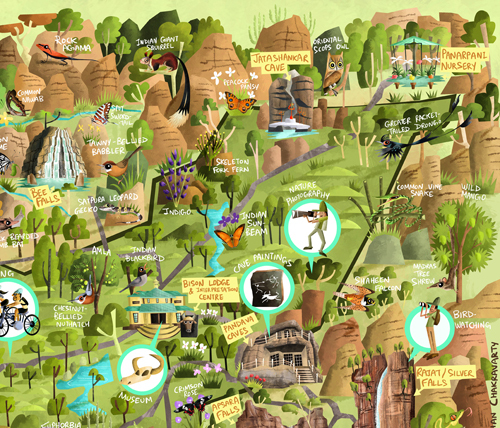 A butterfly-lover's paradise, Pachmarhi is home both to common beauties and exotic endemics. 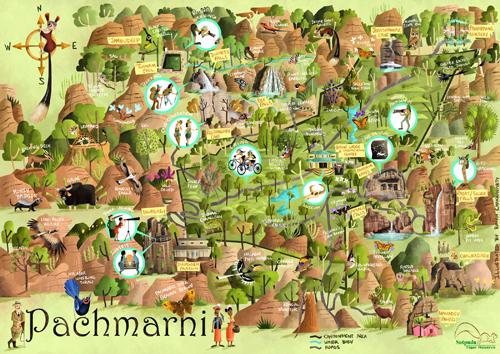 Tourist destinations in and around Pachmarhi. A big thanks to the forest department of Madhya Pradesh and Mr. Anil Nagar for commissioning me for the assignment, and to my friend Puspendu Mandal, Tourism Manager at Hoshangabad for showing me around and helping me gather references for the project!